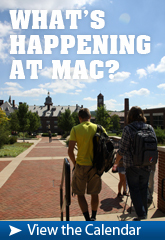 Mount Aloysius College offers Bachelor Degree programs leading to certification in secondary education are available in Biology, English, General Science, and Social Studies through the College’s Secondary Education Program and are designed to provide students with a broad knowledge base in the teaching specialty. 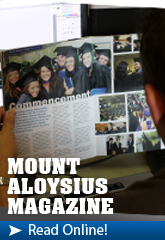 The Secondary Education program at Mount Aloysius College flows naturally from the College’s philosophical roots. Preparation for a career in teaching requires a desire to serve others, engage in life-long learning, and work toward social justice and the common good. The Secondary Education program prepares students to accept people of all faiths and walks of life, respect their individual gifts and talents, and empower those who have been disenfranchised in the system. 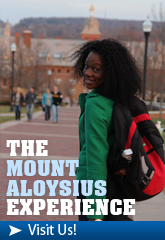 As guided by the philosophy of Mount Aloysius College, students are expected to value and engage in holistic learning experiences that synthesize intellectual, spiritual, emotional, social, and creative ways of thinking, and base their own teaching on these principles. The mission of the Secondary Education certification is to develop teachers whose pedagogy is based on theoretical understandings, who employ frequent reflection, and who are competent in using a wide variety of teaching, learning, and assessment techniques. Recognizing that quality in teaching requires a broad knowledge base and content, Secondary Education students will complete one of the following majors: Biology, English, General Science or History/Political Science to be able to complete a secondary education program. PA State Department of Education changes in regulations may result in changes in the requirements of education programs. All students interested in teacher certification will enter into their desired major program (Biology, General Science, English or History/Political Science) until all requirements for admission into the education department have been met. Biology, Secondary Education Certification, B.S. English, Secondary Education Specialization, B.A. Natural Science, Secondary Education Specialization, B.S. History/Political Science, Social Studies Secondary Education Specialization, B.A.